The phrase "Hair of the Dog" is predominantly used to refer to imbibing an alcoholic beverage to cure a hangover, and is a shortened form of the phrase "The hair of the dog that bit you". Traditionally this phrase was meant to describe the process of drinking the same alcohol you had the night before to help alleviate the side effects of alcohol. The producers of Hair of the Dog energy drinks offer up their own solution, with an all-natural alternative to feeling better in the morning. 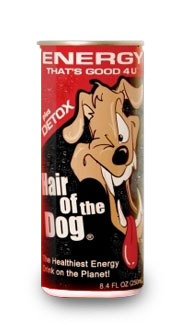 All Hair of the Dog drinks have the "Detox" Hangover Formula and they claim that by making Hair of the Dog the last drink of the night, you can avoid the morning-after affects from alcohol. If you forget to take it before going to bed, Hair of the Dog will supposedly "Take the Bite out of Last Nite" when you take it the next morning. Producer: Innovative Technologies Corporation of America Inc.